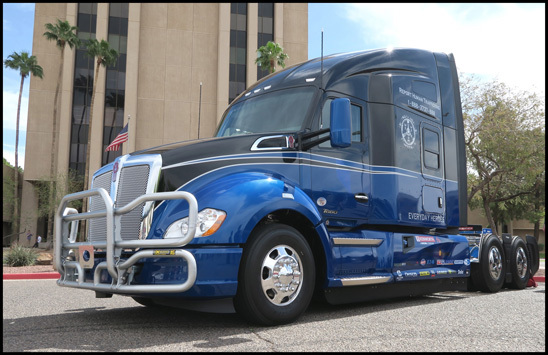 PHOENIX, Ariz., June 15, 2017 – Excitement is building as Truckers Against Trafficking (TAT) prepares to auction off the new “Everyday Heroes” Kenworth T680 at the Ritchie Bros in Phoenix Tuesday, June 20. All the proceeds from the sale go directly to TAT – a 501(c)3 non-profit devoted to stopping human trafficking by educating, mobilizing, and empowering the nation’s truck drivers and rest stop employees. The special Kenworth T680 is fully loaded with a 76-inch sleeper, 485-hp PACCAR MX-13 engine, and Eaton(R) Fuller Advantage(TM) 10-speed automated transmission. Interested parties can bid on the truck in person, online, or by proxy. Bidders can click here to register in advance. Interested parties also can click here to obtain online buying information or call Ritchie Bros. at (602) 269-5631 for assistance. For those able to attend the auction, Ritchie Bros. is located at 5410 W. Lower Buckeye Road in Phoenix. Kenworth Truck Company and Ritchie Bros.
Inland Kenworth, Utility Trailer Sales Company of Arizona, and FlowBelow Wheel Covers. PACCAR Engine, PACCAR Parts, Bendix, Eaton Corporation, Horton, Jost Fifth Wheels, and Meritor. Alcoa, Davco, Delco, East Penn Batteries, ExGuard Grille Guards, Giti Tires, and National Seats.